Firstly a disclaimer, that this is not a sponsored post. I have received no monetary compensation for my affinity for Tazo® Tea. I just happen to love them. Although I strongly feel they should, given the amount of $$$ I spend on their teas every week! I am kind of a tea snob. I drink 4 cups tea everyday. I was raised on Darjeeling Tea and till date it remains my favorite kind. Darjeeling Tea can be had with milk and sweetener but over the years I have learnt to appreciate it without milk and sweetener. I'm addicted to it and it is the first thing I have in the morning, after a glass of warm lemon water. Next, I drink a cup of Green Tea midway between breakfast and lunch. I love Tazo® Tea Zen™ but I also keep Tazo® Tea Green Ginger handy, especially if I have a cold or upset tummy. My third cup is also Green Tea around 4 to 4:30 pm. Finally, post dinner I have my final cuppa of "Dessert Tea" which is essentially non caffeinated Herbal Tea. I love Tazo® Tea Organic Baked Cinnamon Apple. The Bengali in me craves for something sweet after dinner. The sweet under tones from the Cinnamon and Apples help satiates that craving without the added carbs or calories. I first had my first Tazo® Tea Wild Sweet Orange Tea at a friends's wedding. It was a part of the coffee/tea station. The fist sip was a disappointment. It came across too strongly and way too tart for my liking. I remember telling Sam that this would taste way better in a Iced avatar as compared to sipping it hot. My friends knows how much I love my teas. And I'm lucky I keep getting exotic and interesting flavored tea from them. Last June, I got my first pack of Tazo® Tea Wild Sweet Orange Tea as a gift. I wasted no time in turning them into pitchers of iced teas. They were so refreshing! Initially I prepared it exactly like my Iced Green Tea Lemonade with Ginger and Mint but without the additional on lemon. 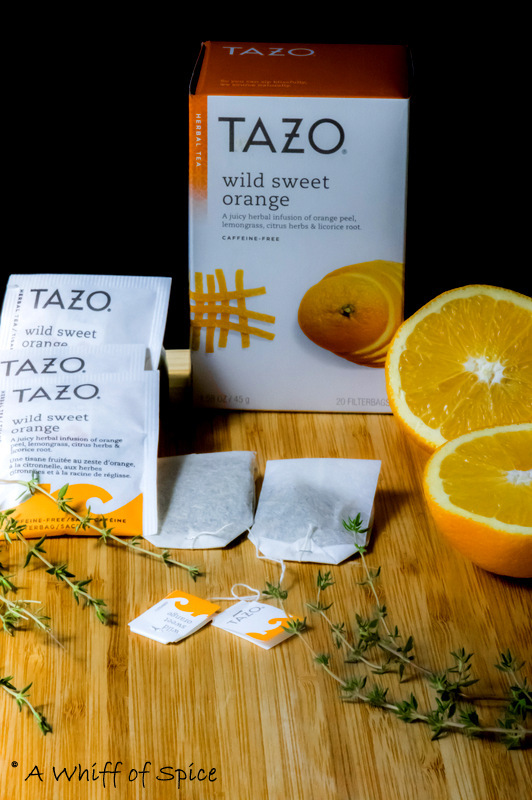 The Tazo® Tea Wild Sweet Orange Tea is naturally tart. But one fine morning I infused it with Fresh Thyme from my garden instead of Mint Leaves. And as they say.... rest was history! The Thyme has a slightly peppery flavor, with a citrusy-lemony undertone. It wonderfully compliments the robust, citrusy, fruity flavor of the oranges. We have been addicted to this Thyme Infused Wild Sweet Orange Iced Tea ever since. And every time Sam takes a sip, he reminds me to post it on the blog. And I keep saying, I'll take pictures next time. And between then and now, we have wolfed down two boxes of the Tazo® Tea Wild Sweet Orange Tea. Yes! We are that addicted! So before Summer officially bids us adieu, here's the recipe. It might just be the drink for your Labor Day barbecue! 1. In a saucepan, combine 6 cups of water and bring to a boil. 2. Once the water boils, remove from heat and add the Tazo® Tea Wild Sweet Orange Tea bags and Fresh Thyme Sprigs. No need to take those tiny leaves off the sprigs! Cover the saucepan and let it steep for 20 to 30 minutes. Alternatively, if using plain black or green tea bags, add peel of one orange while steeping, along with the thyme leaves. Use a zester or a vegetable peeler to peel the orange skin, taking care not to peel the bitter white pith. Do not steep for more than 10 (for black tea) or 15 (for green tea) minutes. 3. Strain the brewed tea. Discard the thyme sprigs and the teabags. 4. Mix the sweetener of choice. I used Raw Honey. Or if you are a crazy person like me and prefer your tea unsweetened, skip this step! 5. Transfer the tea from the saucepan to a pitcher or a bottle or a carafe and let it cool to room temperature, before refrigerating. 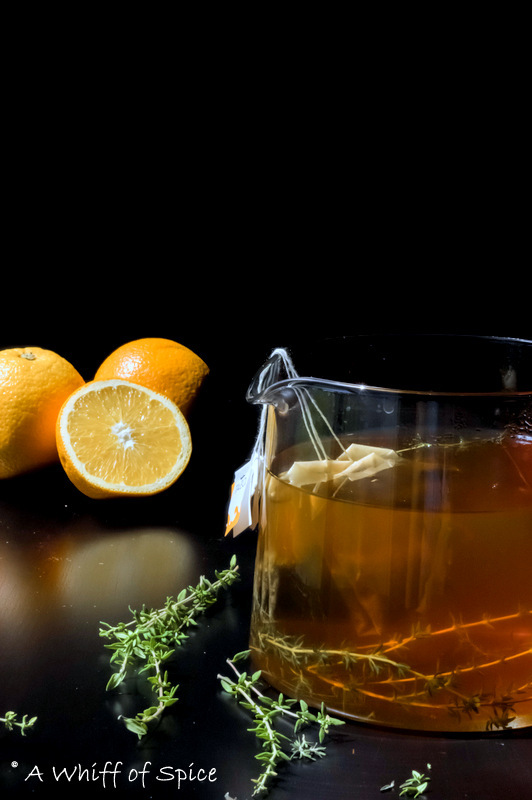 Optional, add slices of one orange to the tea, while it chills, especially, if using plain black or green tea. 6. To serve, add 1 to 2 orange slices (optional) into each glass, along with a small sprig of thyme and ice cubes. Pour the chilled tea and serve immediately. 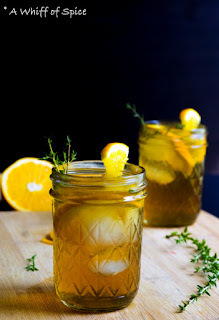 Notes/Tip: The Thyme Infused Wild Sweet Orange Iced Tea can be made with out the Tazo® Tea Wild Sweet Orange Tea. 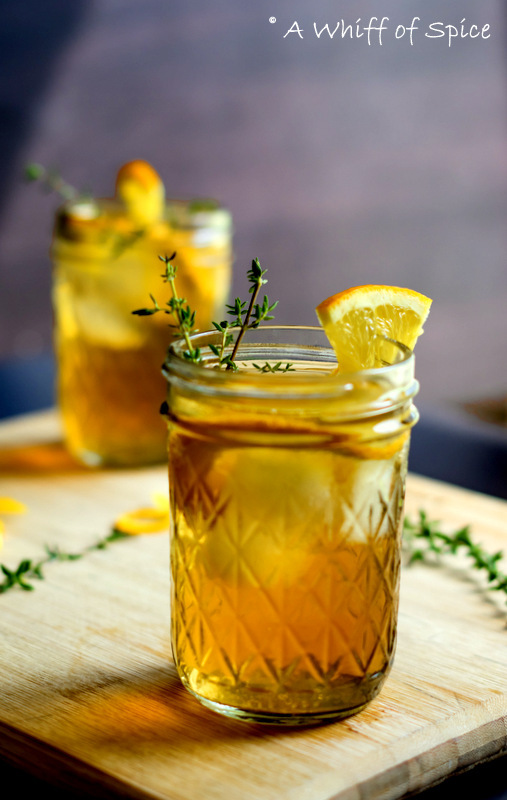 Just use regular black or green tea and infuse it with thyme sprigs and orange peels. It would be just as refreshing and addictive. When we steep the orange peel and orange sliced in the tea, it releases it's essential oils in the tea. The health benefits of Orange Essential Oil can be attributed to its properties as an anti-inflammatory, antidepressant, antispasmodic, antiseptic, aphrodisiac, carminative, diuretic, tonic, sedative and cholagogue substance. IcedteaPitcherReview.blogspot.com tells us everything about iced tea.